You never expected to find yourself living with tooth loss; but now you are in this exact situation. While you may be tempted to leave the empty spaces in your smile, tooth replacement is an essential component to helping you preserve and maintain your oral health. To fill the gaps, you could choose a traditional option, like a dental bridge or dentures, but you have a better solution. 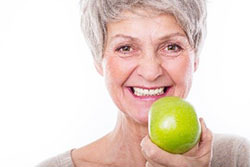 With dental implants in Texarkana, you will gain the next best thing to your natural teeth. Dental implants have quickly become the most preferred and reliable option to replace missing teeth because they have the potential to last for a lifetime with the right aftercare. Due to the unique process that is used to replace both the root and the crown, they provide over a 95% 10-year success rate. A biocompatible titanium post is surgically placed into the jawbone to replace the tooth root. The body naturally fuses to it, allowing a custom-made dental crown to be attached. It will now look and function life a natural tooth by having the security and stability it needs to stay in place. You do not have to worry about any slipping, discomfort, or irritation. In fact, when compared to traditional dentures, dental implants offer over a 70% increased biting force. Not only will you regain your ability to chew, speak, and smile with confidence, but you will also enhance your oral health. 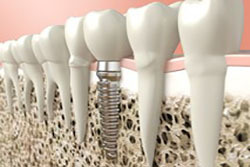 Dental implants are the only tooth replacement option that preserves bone loss. The implant post stimulates the jawbone, encouraging new bone growth. This not only allows it to potentially stay in place forever, but it also helps to protect any remaining natural teeth and your facial structures from bone loss. How Many Teeth Can I Replace? Dental implants can be used to replace a single tooth, multiple teeth, or complete tooth loss. Single Tooth: A dental implant and crown are used. Two Consecutive Missing Teeth: Two dental crowns are often fused together and attached to a single implant post. Three or Four Consecutive Missing Teeth: A series of dental crowns are used to create a bridge, which is then held in place using two dental implant posts. Several Missing Teeth: Depending on the number of teeth that need to be replaced, multiple dental implant posts are used to hold the prosthetic teeth in place. Full Arch Replacement: A arch of prosthetic teeth is created, which is held in place using an average of 4 dental implant posts. Generally, if you suffer from tooth loss and have good oral health, you are a candidate for the procedure. However, they may not be the right option for everyone, so you will need a consultation. In addition to a visual examination and diagnostic imaging, your medical and lifestyle history will also be discussed to ensure that your risk for implant failure is minimal. Based on the findings, we may make suggestions for additional treatments, such as bone grafting, prior to placing your implant posts. The first phase of treatment involves a minor oral surgery to place the implant posts. The gum tissue is opened to expose the bone. A small hole is drilled into it and the post is placed. A protective cap is placed over it to protect it from damage while you heal. Over the next several weeks, your jawbone will fuse to the post through a process known as osseointegration. After adequate healing has occurred, you will return to our office to have an abutment placed, which is a connector piece between the dental crown and the implant post. We then develop a custom-made crown to replace your tooth. Dental implants do cost more upfront than more traditional options, but they are more cost-effective long-term. 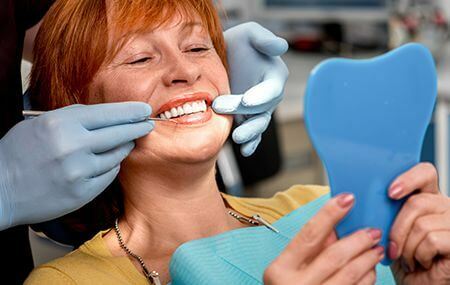 You do not need adjustments or new implants posts placed with the right aftercare, like maintaining your oral hygiene and regular care with your dentist. The amount you can expect to pay for the procedure varies considerably because there is no “one size fits all” solution. There are several factors that contribute to the cost, such as additional procedures, number of teeth being replaced, and your insurance coverage. During your consultation, we will provide you with an estimate and discuss your payment options. If you are ready to stop living with the challenges of tooth loss, it is time to invest in yourself with dental implants. Contact Pleasant Grove Family Dentistry today to schedule a consultation.